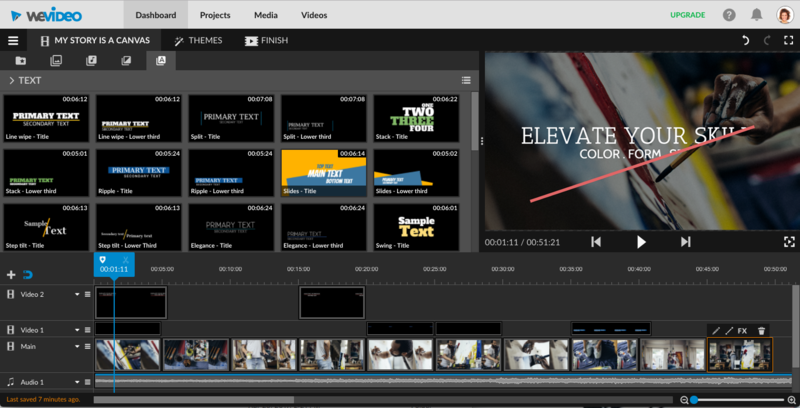 Menlo Park, CA - May 8, 2017 - WeVideo today announced a major enhancement to its leading cloud-based video editing system with the addition of extensive and fully customizable broadcast quality motion titles and graphics. 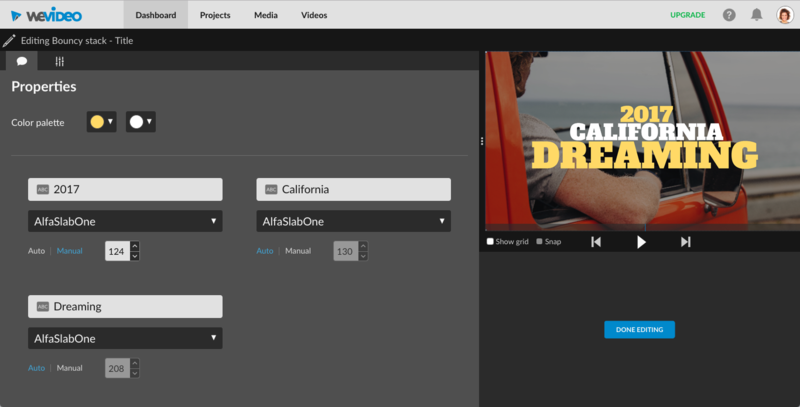 This addition to WeVideo's creative toolset enables users to effortlessly add the same type of creative, informative graphics seen in national ad campaigns, network programming, top news programs and broadcast entertainment to their own videos. Such high-end looks are invaluable to users who want to create marketing videos, attract wide attention to their videos on social media, or just want to impress friends and family. WeVideo CEO Krishna Menon said, "Great video is ultimately about telling a rich, complete story. That's why professional producers invest enormous sums into hardware, software and specialists to add motion titles and graphics to their productions. 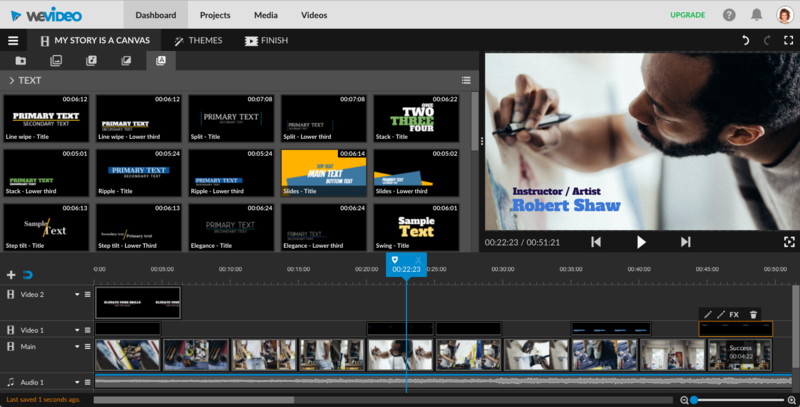 Now WeVideo motion titles let anyone quickly create meaningful videos with spectacular, engaging and informative animated text and graphics elements. Whether your audience is customers, friends and family, or your teacher, WeVideo motion titles are the finishing touch for commercial or personal video stories to ensure that they get noticed and have an impact." Like all of WeVideo's advanced tools, motion titles are seamlessly integrated within WeVideo's award-winning, intuitive web app interface. 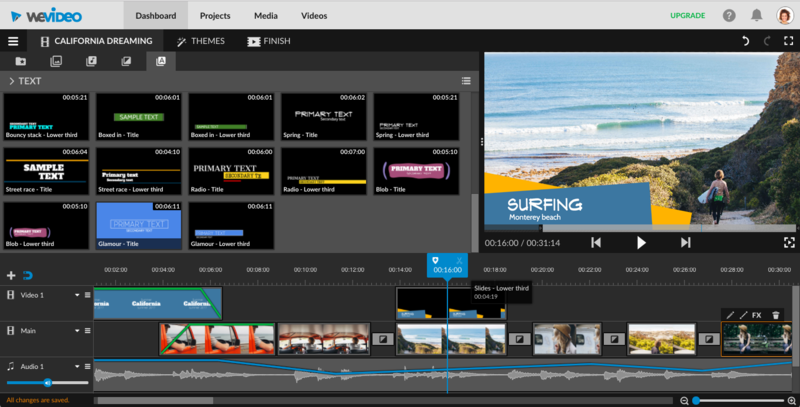 The motion title feature is fully supported by WeVideo JumpStart™. This means users can start editing immediately without waiting for video, audio and graphic assets to upload to the Cloud. WeVideo motion titles and graphics work seamlessly with every supported resolution up to stunning 4K UHD. Adding a motion title and graphic is as simple as dragging and dropping a style to a timeline or storyboard and typing the desired text. Every motion title starts with a ready-to-use, default animated template that was designed for maximum creative impact by a leading creative and media post-production house. These templates are a tremendous timesaver. Instead of having to create each individual element of a sophisticated title, the user simply picks a template, adds text, chooses their preferred fonts, colors and sizes, and the title is done. At any time, easy-to-use controls let the user fine tune the look by customizing almost any parameter including orientation, timing, position, layout, opacity, colors, fonts, and font size. 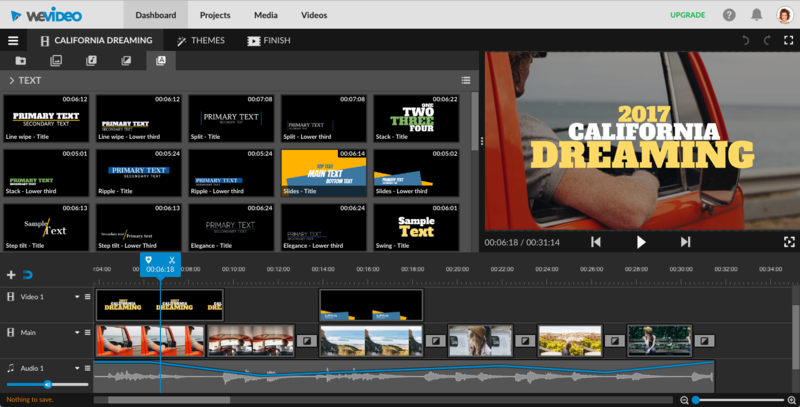 WeVideo's virtually unlimited tracks further enable the user to freely mix and match multiple motion title styles and elements. 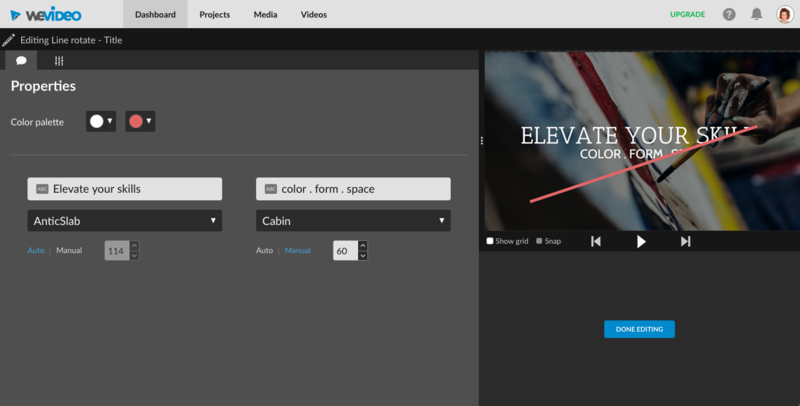 Combined with the effectively boundless creative toolset of WeVideo, users are able to create unique, personalized looks. Nearly 40 templates provide a jumping off point for endless creative options to suit any video project, from professional ads to fun personal videos. The categories of styles available include Corporate and Clean, Elegant and Sophisticated, Fun and Funky, and Bold and Daring. From broadcast television style lower thirds such as tickers and other scrolling information, to captivating animated titles that demand the viewer's attention, are all available. WeVideo provides users with a massive creative palette for video editing, graphics, green screen, special effects, speed control and more. WeVideo lets the user freely mix and match more than 600 audio, video, and graphics media formats and supports video resolutions up to stunning 4K. Since all the heavy computer processing demands of video editing are handled in the Cloud, every user gets the benefit of a world-class editing workstation, anytime, anywhere. WeVideo works on virtually any Apple, Windows or Google Chromebook, and there is never software to install or update. WeVideo projects can be accessed anywhere, at any time, on any device. Finished projects can be streamed from the web, shared online, or saved offline to watch on TVs, projectors and devices.